The Kentucky broadcaster opens up to reveal who "the man behind the voice" really is, the iconic moments and calls he has been a part of, his love of horse racing, his preparation, Cawood Ledford, his journey before the Wildcats, and what Big Blue Nation can expect in the future. Inside the I Heart Media studio on Nicholasville Road, “The Voice of the Kentucky Wildcats,” Tom Leach, is wrapping up “The Leach Report.” Leach, a 1983 graduate of UK, has guided the Big Blue Nation through moments of triumph and moments of heartache. Through it all, Leach’s booming voice has been there to comfort and provide analysis for the Kentucky faithful just like play-by-play announcer Cawood Ledford did for 39 years. One thing Ledford said that Leach has learned to be true. Holding the job of the Kentucky football play-by-play announcer since 1997 and getting the Kentucky basketball gig in 2001, it’s a role he had wanted since he was in middle school. Growing up as a Kentucky fan and Cincinnati Reds fan, he got his play-by-play training from the likes of Ledford, Ralph Hacker, Marty Brennaman, and Joe Nuxhall. Leach says it was better training than any class he could’ve taken. Long before he got to the UK Network and with baseball being his favorite sport and the realization that he wouldn’t be playing MLB, Leach wanted to find a way to stay around sports. He lobbied for a job at a Paris radio station doing Bourbon County and Paris football games. They finally gave in and hired him to keep stats and would let him on the air at halftime and postgame. Leach says it was basically to give the play-by-play and color guy a chance to go to the bathroom. One high school in Lexington wanted to buy time on radio to do every game that season. They did that and Ralph [Hacker] encouraged Leach to take it. Looking back, Leach says it was great advice because he got to hone his skills doing a game every week. Ralph Hacker, Cawood Ledford, and Tom Leach. 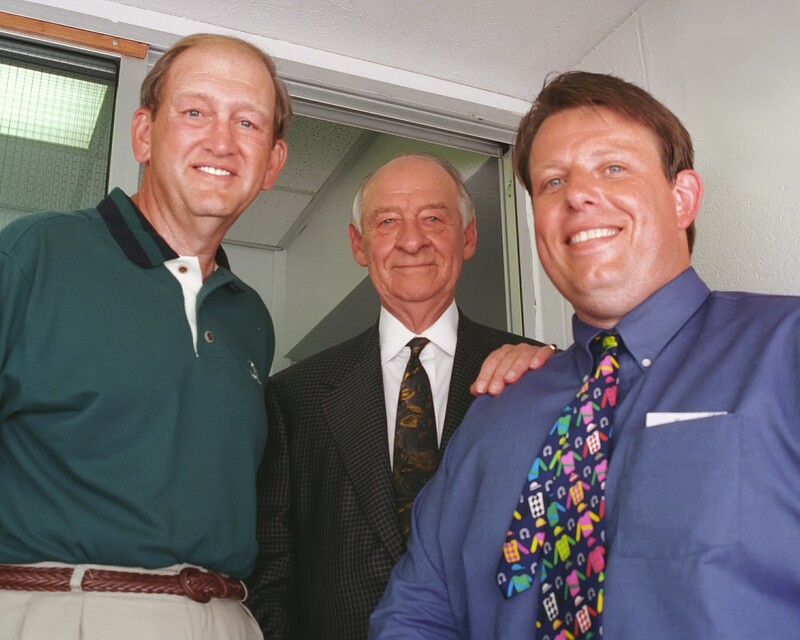 In the spring of 1997, Leach remembers interviewing for the Kentucky football announcers gig. He knew Ralph [Hacker] was in his corner but Jim Host was going to make that decision and wouldn’t hesitate to go in a different direction if Leach wasn’t the best candidate. There was no shortage of excitement in Leach’s first game at the helm. There were plenty of fireworks in his first game as quarterback Tim Couch threw for three touchdowns in the first quarter for a 21-0 lead over arch rival Louisville in the launching of the “Air Raid” era under head coach Hal Mumme. You couldn’t ask for a better way to start your career. Over the years, Leach is often asked about his most memorable moments on the job and which calls he has enjoyed the most. Without hesitation, Leach cites his list: The 2012 NCAA Championship, UK football upsetting No.1 and eventual national champion LSU, his debut against Louisville in football, Couch and Yeast helping UK beat Alabama for the first time, Tayshaun Prince’s five threes against North Carolina in Leach’s first basketball season. However, during the John Calipari era, there’s a special one that sticks out to the broadcaster–the Brandon Knight shot to upset No. 1 Ohio State in the Sweet 16 because even though the Wildcats still had to play the Tar Heels in the next game, he knew that was the game that would lead to calling his first Final Four. Kentucky’s exciting run to the national championship game as an eighth seed in the 2014 NCAA tournament stands out as some of the most exciting calls Leach has ever got to make. You don’t spend this many years in broadcast without some humorous stories or difficult interviews. In the early days of his UK career, Leach was doing a local pre-game show, covering the game, post-game, and a call-in show. It’s a grueling workload for a single day so a lot of things were running through Leach’s mind. During the pre-game show, there are a lot of commercials Leach had to hit at certain times. While he was interviewing a play-by-play guy from Kentucky’s opponent, Leach had asked him a question about the play-by-play guy’s father who was also a broadcaster. Calipari has never had a shortage of words to say when being interviewed and being quite candid, however, not all past Kentucky coaches were as easy to interview for Leach. The two years that Billy Gillispie coached the Wildcats provided many memorable and awkward interviews. Tom Leach posing in front of the Secretariat statue in the paddock at Belmont Park. A love of horse racing is to be expected for Leach considering he grew up in Paris, home to Claiborne Farm. The famous farm was home to Secretariat, arguably the greatest thoroughbred of all-time. Through some friends, Leach had connections to the famous farm and got exposed to horse racing very early in life. He still pauses while reflecting on the memories of seeing Secretariat posing for the photos as soon as he heard the clicking sound of the photographer’s camera. Needless to say, Leach was a huge fan of Secretariat. While in high school, Leach watched Seattle Slew and Affirmed make their mark through each leg of their chase for the Triple Crown that they would eventually win. He was just barely into the broadcasting business but knew he wanted to also covering horse racing and actually see a Triple Crown victory in person. With a crazy demanding schedule, Leach is grateful that his family is very understanding. His wife, Robyn Rabbeth, is a former TV news anchor so she knows the hours that are required to work in media because she did it herself. In regards to hobbies, Leach enjoys connecting with friends, some which go back all the way to first and second grade. He plays a little golf, he loves movies but usually doesn’t get to see them until the seasons are over. His love of horses also has him doing some work for Keeneland and in the summer, he gets more into racing. Summer is when Leach family vacations take place because from the middle of August until after the Kentucky Derby, Leach is in 24/7 mode. A rabid fanbase like the Big Blue Nation talks Kentucky sports all day long and knows the whereabouts of every prominent Kentucky sports figure. Leach understands the passion and what comes with being “the voice” for the people. “The thing with Claude Sullivan and Cawood Ledford, they set the bar high. Ralph continued that. The Kentucky fans are going to let you know if you’re not doing the job because they expect excellence from their teams and their broadcasters and everything. I want to be able to stay at a high level and know when it’s time to step away because inevitably, “Father Time” is undefeated.